Who is the LFA Project Open To? 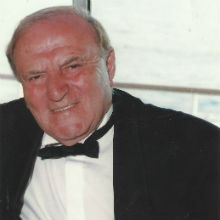 Leslie was born on 29th May 1929 in Ambud, a small village near Satu Mare in Romania, into an Orthodox Jewish family. He had four brothers and three sisters and his father was a Rabbi. The family's peaceful world was first disrupted when Hungary occupied this area of Romania in 1940. Worse was to come in 1944 when Germany invaded Hungary, arriving in Ambud on a Saturday, the Jewish Sabbath. A German soldier cut off his father’s beard, which for a very religious man was a terrible insult. His father was then taken, supposedly to dig trenches on the Eastern Front but in fact to Auschwitz-Birkenau. In April 1944, the rest of Leslie’s family were forced to leave their home and enter the ghetto, where they were held for a month. From the ghetto, Leslie and his family were deported. They were told that they were being sent to Germany to work, but instead they were taken to Auschwitz-Birkenau. Although Leslie was only 14, he said that he was older and was selected for work. He was separated from the rest of his family who were all taken straight to the gas chamber with the exception of one sister. At Auschwitz-Birkenau, Leslie worked building a railway and later worked unloading bags of cement from the trains. Towards the end of 1944, with the Red Army approaching, Leslie was sent on a death march to Sachsenhausen and then onto Flossenbürg concentration camp, where he stayed for approximately three weeks. From there, Leslie and the remaining prisoners were sent on a second death march towards Dachau concentration camp. During the march, while they were in a forest, all of the Nazis disappeared and Leslie was liberated by American troops. One of the soldiers arranged for him to be sent to an American-run hospital where he spent the next two months. Leslie was then sent to a monastery to recuperate for six months. During this time he learnt that his sister, who had been selected for work at Auschwitz-Birkenau, had died soon after liberation. While Leslie was at the monastery, he was told that the British government were allowing 1,000 child survivors to come to the UK. Leslie was one of this group who became known as 'The Boys'. Leslie went on to marry and settled in Canada, having two children. He later returned to the UK and now regularly shares his experiences in schools and colleges across the country. The Holocaust Educational Trust is a registered charity in England and Wales (1092892) and in Scotland (SC042996).